What began as a senior thesis at Wesleyan University over forty years ago for Ted Reed, turned into a long overdue tribute to one of Brooklyn’s overlooked “Boys of Summer,” Carl Furillo. Reed, author of “Carl Furillo: Brooklyn Dodgers All-Star,” (McFarland, 2010) appeared Wednesday evening at Bergino Baseball Clubhouse in New York to set the record straight about the rifle-armed right fielder’s legacy regarding Jackie Robinson’s debut and Furillo’s messy divorce from the Los Angeles Dodgers. Furillo was wrongly labeled as an opponent to Robinson’s entry into the Brooklyn Dodgers, with false innuendo spreading that he was one of the players circulating a petition against Robinson. “Furillo was wrongly painted as a racist [in the media],” Reed said. “He was the Italian fall guy [so the writers] could make Branch Rickey look better.” This tag would follow Furillo into retirement, infuriating the long-time Dodger outfielder. In fact, Furillo was so affable with Robinson, Reed revealed that Furillo kissed both Robinson and his wife Rachel after winning the 1955 World Series. He was part of an aging group of veterans that followed the Dodgers to Los Angeles from Brooklyn in 1958. 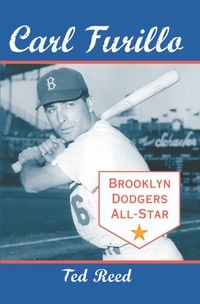 Like his Brooklyn counterparts, the sun was setting quickly on his career, moving to a platoon role by the 1959 season. Furillo was potent enough to help the Dodgers win Game 3 of the 1959 World Series with a pinch-hit single; however, that was his last hurrah, as injuries would force the end of his career early in the 1960 season. The injury left Furillo just short of earning his 15th year of service time for the major league pension, which would have greatly impacted his pay in retirement. He sued the Dodgers for the remainder of his 1960 salary and entered in a drawn-out battle with Buzzie Bavasi in the newspapers. The Dodgers moved to settle and pay Furillo’s demands. While Furillo may have won the battle, the bitter Dodgers won the war. Furillo would never work in baseball again. Reed encountered Furillo at the same time he was being interviewed for Roger Khan’s epic, "Boys of Summer." While still bitter with baseball, Furillo opened up to him, building an unparalleled relationship with the upstart biographer. The result of their friendship is an illuminating look into Furillo’s career, one that deserves the same platform as his legendary teammates Reese, Robinson, and Snider.